I ran across this information this afternoon while researching the Green Hilton Agreement – Geneva 1963. By 1961, Keynes predictions of a world monetary crisis began to become a reality. This problem was brought about by the lack of sufficient currency (especially US Dollars) in world circulation to support the rapidly expanding international commerce. The World needed US Dollars beyond the capacity of the good faith and credit of the United States Taxpayer in order to facilitate trade. It was not possible to break the Bretton Woods treaty due to the possible damage of the stable core of the world’s economy as this had the potential of leading to another major war. To compound the problem, the majority of dollars in circulation were in private banks, multinational corporations, private businesses and individual bank accounts. In 1963 the gold that had been entrusted to the care of President Soekarno was recalled by the Nations to underpin the issuance of further US Dollars in order to further facilitate international trade. Under this Agreement, Soekarno (as the International Trustee Holder of the Gold) began the process of repositioning the gold that had earlier been entrusted to the care of the Indonesian People, back into the banking system to create a fractional backing for the US Dollar. Initially this was managed under the arbitration of the Tripartite Gold Commission in The Hague as per the decisions of the International Community through their Government representatives at the Innsbruck/Schweitzer Conference and its later revisions. Under the agreement signed between President Soekarno and President John Kennedy, was that control of these assets would cede automatically to US upon the fall from power of President Soekarno. This occurred in 1967. The potential of this agreement led to Executive Order 11110 issued July 1963, which would have provided the Department of the Treasury the power to issue United States Dollars. Within two weeks after signing the Green Hilton Agreement which would have then enabled consolidation of EO 11110. Kennedy was assassinated a few days after his signing of the Green Hilton Agreement. With the death of Kennedy, the authority granted to the Treasury was never taken up. Soekarno was awarded a 2.5% interest in the assets by the International Community in return for his services. He willed all the documents of guarantee and obligation to his Teacher ***** ***** ******** and his heir, ** **** *** ********. While an apparently innocuous document to read, in it’s proper and full interpretation, The Green Hilton Agreement is one of the most profound agreements made between Presidents of any two countries within the twentieth century, and most probably, in the history of the world, particularly so as this agreement was made between a President of the United States and the Trustee of the hidden, but combined wealth of the world. These assets are not the property of the United States, but centralized assets under the authority of a centralized system, to be used as independently deemed to be for the better benefit of the World. SENT: Tuesday, Mardch 04, 2008 11:56 p.m. Regardless if one agrees with the account given by Mr. Whistleblower, there is one sentence which fails to connect to the other parts of the story. As I have seen the Green Hilton Treaty (full title: Agreement Green Hilton Memorial Building Geneve and Certificate of Geneve, signed by 3 persons, witnessed by 9 persons) some years back, I am wondering what the connection between the Wanta case and the Green Hilton Treaty might be? Can you forward my question to Mr. Whistleblower and act as a go-between for his replay? In response to the question from PZ. Thank you for your question via fourwinds10.com. The comments in question do not relate directly to the other content. They are meant to clearly indicate that the US, by not recognizing the Green Hilton Treaty, actually deny that the assets held by President Soekarno are part of the Combined International Collateral Accounts of the Global Debt Facility, thus implying that they still belong to the original Owners (hereditary or otherwise). The fact is that assets held by Soekarno were not owned by Indonesia, its’ numerous Sultanates, or otherwise, but by several other countries, Royal Families, etc. which were deposited in Indonesia commencing 1921, which is the very same period as assets were deposited in The Philippines. It was the Japanese who were charged by the World’s Nations to undertake the excavation of tunnels, mines, bunkers, etc, and deposit assets within same as and when then were shipped to Indonesia. It is common knowledge that over the years the US has deliberately broadcast over the Airwaves, that they are the real owners and that anyone locating or finding any assets should report same to the US Embassy immediately. This was a ploy by the US to locate assets and ultimately steal them. Not recognizing the Green Hilton Treaty, which was relevant to Indonesia and President Soekarno, allowed the US to lay claim to the assets and thus steal / plunder them for their own purpose. Additionally, the US, by its denials and non-recognition of the Green Hilton Treaty, opened the doors for descendants of President Soekarno, plus many others who were appointed as Secondary Holders, Administrators, Sub-secondary Holders / Custodians etc by President Soekarno (Note: we hold a full list of these people, which is embodied within President Soekarno’s records, Volume 4), to lay claim to the assets held in Indonesia. The very same situation arises with The Philippines and other countries. In Russia alone, during the Yeltsin era, President Clinton claimed that the Gold deposited in Russia was actually owned by the US. Thousands of MT of Gold were moved out of Russia by train into Switzerland and Germany, under orders of President Yeltsin. This movement was monitored and President Yeltsin was held to order on this. His condition to step down from the Presidency of the Russian Federation, entailed a Full International Immunity from prosecution for his criminal acts of Theft of Assets from the Collateral Accounts in conjunction with others (These acts are beginning to come back and bite the other persons involved quite viciously). Coming back to the point of issue. The statement was made as an example to indicate the tactics used by the US to steal, illegally use, plunder, etc the assets of the Combined International Collateral Accounts. The example was considered to be the best possible example as it linked to a situation in the US which is still questionable today. Other examples could not be used as much as this, and corrective actions against such illegal use, abuse, theft etc, are all “Classified”. In respect of your statement claiming you have seen the Green Hilton Treaty. We do not dispute your claim on this, but advise as to caution. The reason being is that there are at least Three (3) known forgeries of this Treaty in existence. There may be more. All differ from each other and all of them do lead to confusion with those who make claims of having read the Treaty. It is not known who composed any of the forgeries, although guesses are abound. The “Real” Treaty states, that an agreement has been reached, and shall be referred to as a “Treaty” between Sovereign Nations, by the President of the United States and the President of Indonesia, that Assets of the Combined International Collateral Accounts pursuant to Treaties ……. (numerous Treaties referred to) ……. and held under Custodianship within Indonesia, shall be transferred to ……… (Name of location in the USA) ……… and utilized by the USA to fractionally back the International Currency of the US Dollar. Note, the content of the treaty actually states several further issues, but the above is the main issue. In return for President Soekarno’s cooperation in this matter, conjointly with the Owner / Sole Arbiter, Indonesia were given financial Hereditary rights equal to 2.5% of the value of the assets, to be used within Indonesia to assist in the development of the country. Those rights and with full reference to the Green Hilton Treaty were confirmed within the “Recognizing the Rights” Treaty, Bangkok, Thailand, dated 2003. You will also find reference to all of this within various Schweitzer / Innsbruck Conventions. Needless to say, the assets have yet to be used for the benefit of Indonesia. Some have been moved illegally, some stolen / plundered, but basically the two aforementioned Treaties remain ineffective and unrecognized by the US, whom, through the Federal Reserve prevent movement, allotment, allocation, or otherwise of same for use not only for Indonesia, but for every other country in the World and the People. Many Indonesians, as with Filipinos, travel the World holding various Gold and Platinum Bullion Certificates, claiming they are the owners of the Bullion, only to be arrested and incarcerated. This will continue until the Truth comes out. There is no direct connection to the Wanta case, as may or may not have been implied. The statement was used as an example to indicate to others what mechanisms are used by the US and others to illegal use, steal, plunder, etc, assets of the Combined International Collateral Accounts. We apologize if this lead to a misunderstanding, as we did not purposely or intentionally design this statement to be misleading. There are many factors connected to the Combined International Collateral Accounts, illegal activities, theft, plunder, etc that are all inter-related in one way or another whereby to isolate one issue away from all the others is not easy. To understand the enormity of the situation one has to understand the whole picture and appreciate the relativity of one part to other parts. We do not purposely or intentionally restrict illegal activities to the US, although the US is responsible for a substantial majority of the problems involved. Other Countries, Central Banks, Rogue elements of Intelligence Agencies, Commercial Banks, individuals, have also been active in the area of Theft, Plunder, Illegal use. We hope that this has satisfactory explained the statement we have made, and we thank you for your interest in same. Please feel free to seek further answers should you find the need to do so. Additional information at “QUESTIONS TO MR. WHISTLEBLOWER (Updated April 29, 2009)”. ALF, I have accurate and verified information that OITC is real and not a fraud. It has been subject to a disinformation campaign throughout the internet. Since this site purports to provide encyclopedia information, it should not be used as a disinformation site. If you have proper security clearances and authorizations, and follow protocols for level 3-5 security rules you can get a verification. I communicate with top level government officials and so do others posting against this disinformation campaign. Your other poster has no real information, only disinformation and the spreading of false stories by authors who never had access or proper information. This is an unusual situation. It involves classified institutions protected by the US Congress under security rules 3-5. If you have such security clearence, the Chairman of the Ways and Means Committee has the full jacket. It requires formal authorization. This is not a dispute that can be settled by the uninformed and unauthorized. Allowing the authorship and reprinting of intentional misinformation in this case is improper. No amount of unauthorized research will turn up anything of substance, only misinformation. The other party writing, can only find and post misinformation. News stories etc do not provide truth. If you happen to be a head of state or head of a central bank, providing that you follow security protocols, you can get verification. Treaties between nations, and classified protocols attached to them, are a fact of life that impacts this discussion. Classifying this as a fraud and implying that its officers are criminals is improper. The courts have ruled that no web site may be exempt from the rules of defamation. The author Waffelknocker is a police officer who has investigated OITC and who knows that it is real and neither a fraud nor otherwise criminal. Your other author just repeats falsehoods and stories written without access to real information. OITC is very real. Classification protocols are intended to prevent unauthorized access, and this frustrates many writers who think that they deserve such information. He, however, knowingly ignores all countering information, as such his own behavior is now quite possibly criminally slanderous. 128.59.153.160 intentionally deleted sources supporting the information provided by Waffelknocker. I believe that permitting this misinformation campaign to persist is defamatory and I will recommend that litigation is initiated. * 4 Who are you? Hey, you guys there in Thailand… Do you really think you are going to scare us by saying that you are “police officers” and “have links with international authorities”? You are nothing but a bunch of cheap scammers, trying to make a buck out of the backs of poor people. You failed miserably in the Rover case, in Fiji and now in Ecuador. Mind you, now the info about your escapades is all over the net. And we are monitoring you to check where else the ugly head of your scam shows up. So keep going on, people, because now there are some good citizens that will take the time and effort to unmask you, no matter where you go or what language you use. Say hi to Pablito and Keith (if you are Ray 😉 Sayonara! REPLY: Wrong people. The promise about litigation is real. No scams have ever been done by OITC. See you in court. REPLY: INTERPOL HAS NO PROBLEM WITH OITC. SEE YOU IN COURT. REPLY 3: Oh, really? Good that you console yourself that way 🙂 Once their agents come knocking at your door you will feel a bit surprised, thought 😉 About court, again, I most certainly will see you there… while you and your helpers are tried for fraud 🙂 Looking forward to it! Then this will have to be resolved in court. Not a threat, but a promise. This site and the writers have a legal obligation to not publish malicious defamatory material. I request that this article be deleted. This is part of a worldwide disinformation campaign against OITC. Waffelknocker is a police officer who has investigated OITC. He has posted accurate information supported by fact. OITC is a classified UN Chartered institution. The full jacket, security level 3-5, is held by the Chairman of the House Ways and Means Committee. Verification requires authorization. Chapter One on Redcat’s Precious Metals Board has published a letter from the General Counsel of the US Treasury in support of OITC and its’ Chairman. He has had the letter verified. The writers of this article only publish falsehoods, misinformation, and lies. They do so knowingly. They delete all writings contrary to their own misinformation campaign. They do so even when their own writings are left alone. Any lawsuit against these writers will have as witnesses the US Attorney General, as well as other such positioned officials. This is a fact based upon personal knowledge. Do not damage this site by allowing it to be used for malicious defamers. No amount of discussion on this site by the uninformed will bear any fruit. You cannot resolve this conflict. As stated within several United Nations Official Publications, some of which can be found on the UN Web site, others are the official legal definitions as attributed by the United Nations and found within records of the United Nations Library. The term “Charter” is used for particularly formal and solemn instruments, such as the constituent treaty of an International Organization. The term itself has an emotive content that goes back to the Magna Carta of 1215. Well known recent examples are the Charter of the United Nations of 1945 and the Charter of the Organization of American States. The question was posed, quote “Are all Charters under the United Nations subject to Public Access to Information Acts”. Reply, quote “No Sir, there are many such documents that are classified, which are not available for Public Access.” “How many”. Reply, quote “Many Sir. Is there a particular Charter you are enquiring about”. “No, no particular Charter. This is a general enquiry for a paper I am writing. Thank you for your help.” Reply, quote “Glad to be of assistance Sir. If you need further information, please call back. Goodbye”. The above is a transcript of a telephone conversation between a 22 year old University Student in the U.K. studying Law, and an official at the United Nations, Geneva. At the same time the student was on the Web with the United Nations Web site open, clicking on various sections based upon words or directions given by the UN official. The telephone call was quite extensive. The above are the pertinent points of the conversation held. General conversation to and from each person is not relevant and not transcribed. Also posted by the same party:” I can also state that this letter has been verified as being issued by Russell L. Munk, International Division, US Treasury, Washington DC, 20220, USA. A further letter has now been delivered to the US Treasury, Senior Counsel US Treasury, Mr Arnold I. Havens. This letter (following verification of the Munk letter) details specific pertinent questions more elaborate that the answers contained in Munk’s letter. It will be posted when a response is received. 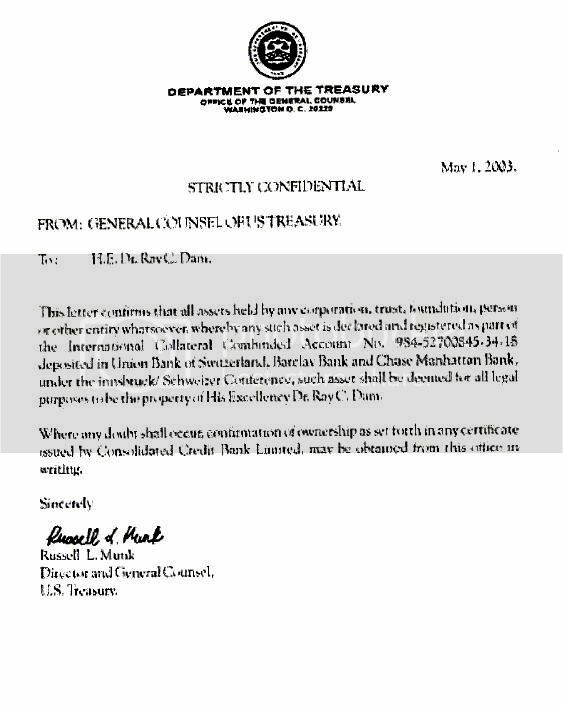 I can state that Russell L. Munk has now been verified as the General Counsel, International Department, US Treasury, Washington D.C. 20220, USA, at the date of the letter. My comments in the previous posts are as a result of thorough investigations undertaken by some very senior friends working for a Police Authority. It would be highly unusual for them to make a mistake, so I will admit to the possibility of an accidental omission, from a possible brief loss of concentration, of the word Assistant in respect of Mr Munk. 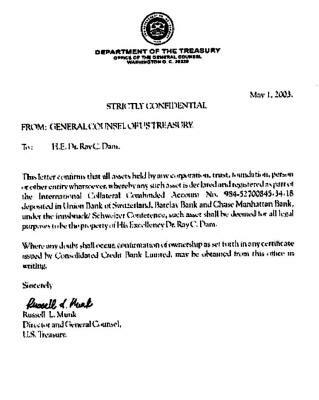 It is however irrelevant as to Mr Munk’s position, as the actual letter is confirmed, by the very same friends who have been in communication with the US Treasury, as being issued and signed by Russell Munk. We have to look at the overall situation and protocol involved. If what we are led to believe is fact, then it would be reasonable to assume that any inquiry letter would have been addressed to the General Counsel of the US Treasury. In which case, it is more than possible that the said letter was passed to Russell Munk for a response, as he was of the International Division of the US Treasury, but under the auspices of General Counsel. This being the case and the fact that the inquiry was addressed to the General Counsel it would be highly respectful and indeed protocol (remember what we are told that H.E. R.C. Dam is a protected person, with level 3 -5 security, confirmed by the US Senate) to ensure that the response came from the General Counsel, irrespective of the signature provided the signature was from a person who holds the authority, position and responsibility to sign such letters, either as legally representing the US Treasury, or under authority of the General Counsel. I believe that the General Counsel and Deputy General Counsel are political appointments, which in itself may have some bearing on the issue, considering that the accusation has been made in the past about the US Government and its Intelligence Agencies illegally using the assets owned by R.C. Dam held under the Combined International Collateral Accounts. That would certainly account for a delegated responsibility factor, as I am reasonably sure in saying that the political appointments would surely hesitate from putting their signatures to such a letter. I don’t think the actual letter or signatory can be “questionable” as you put it, because of the verification process undertaken, initiated and undertaken in conjunction with myself / police authority. What is more to the point is the system of authority, delegation, position and responsibility that is operational within the US Treasury, which I believe only the US Treasury can inform us on this matter, as it is internal operations (sometimes politically oriented) and not normally known to the public. Just for the record, I am unbiased on this whole issue, and I do not post all precise detail, which is where people tend to “pick up” on certain issues. Whether the OITC exists or not has yet to be proven. As yet I have seen no proof that it doesn’t exist, despite all the anti-postings which lack substance. I have seen sufficient pro-OITC postings, with good information, and have undertaken enormous research using some of that information. My opinion, as at this moment, is that the possibility of the existence of the OITC is beginning to look more real based upon the evidence I have at hand undertaken by myself, friends in a police authority, and several others including lawyers, UN officials, Members of the Queens Court, and Lords of the Realm, even conversations with OITC people. You can’t get much better, or much higher. Whether I utilize one source or more at the same time and on the same point, I get the same answers. I have yet to substantiate any of the anti-OITC comments posted on this Board and in the Press, but I do admit, I haven’t really focused on past histories of individuals involved, suppositions, conjecture or similar. All research is based upon pertinent and relevant points that are the Start Line…… Where the Finish Line is has yet to be seen. OITC does not have a web site, it is classified, it has no connection to Nigeria or any Nigerians. OITC does not lend money, it is an investor. It takes no fees, NO FEES at ALL. PER SE it cannot be an advance fee scam, and it does not provide credits as alleged. Waffelknocker provided proper sources. If you want a letter from OITC’s lawyer, one can be arranged. Since I cannot comment directly to the discussion re deleting this article, I hope that my additions to this talk reply are read and incorporated into the discussion. To counteract your repetitive old post, I will also refer partially to the same tactic by reposting the US Treasury Letter and (something NEW) a retype of the US Treasury Letter. As the original Munk letter is partly illegible I have retyped same so that it is legible. 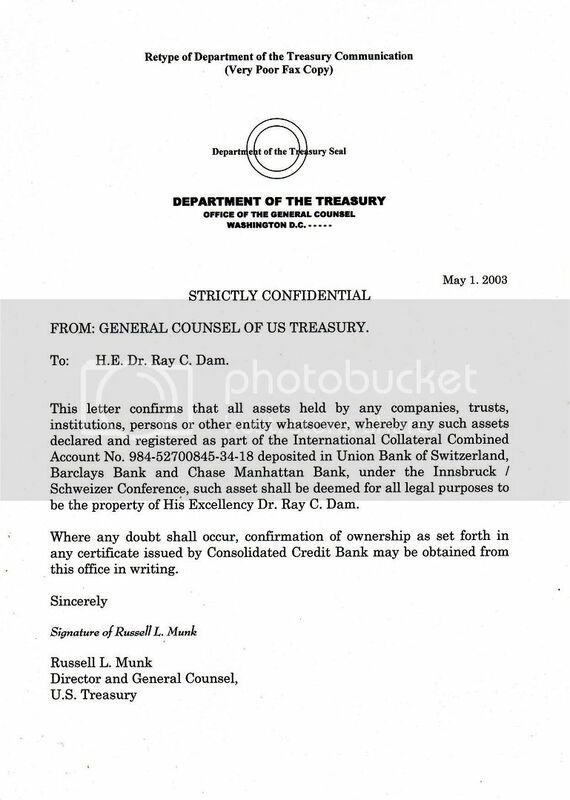 I can state that Russell L. Munk has now been verified as the General Counsel, International Department, US Treasury, Washington D.C. 20220, USA, at the date of the letter. Mr Munk, from what I am informed is no longer with that department, having been moved to head the department responsible for assisting Iraq is re-establishing their Treasury and Central Bank. In fact it wasn’t long ago that he was actually in Iraq. 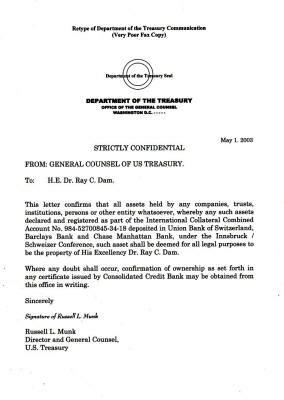 I can also state that this letter has been verified as being issued by Russell L. Munk, International Division, US Treasury, Washington DC, 20220, USA. A further letter has now been delivered to the US Treasury, Senior Counsel US Treasury, Mr Arnold I. Havens. This letter (following verification of the Munk letter) details specific pertinent questions more elaborate that the answers contained in Munk’s letter. It will be posted when a response is received. I can also state that a Police Authority (and not from some two bit Banana Republic) has undertaken enquiries on both Ray C. Dam and Keith Scott and have established that these persons are not crooks, convicts, gangsters, criminals or similar. OITC invests, it does not take anyone’s money or property. Since it does not seek money it is per se not a scam of any financial type .It scams no party. Either it delivers assets or funds or it does not. The argument that it is a scam is illogical. Who is it harming? What is presented by claimants is gossip, speculation and ignorance. No credible evidence of criminal behavior has ever been presented. It is interesting that when an institution offers to do good and help people with concrete assets of independent valuation and verification that parties smear it. Waffelknocker provided information that valuable assets were delivered and verified by reputable financial institutions. Quoting old news stories speculation about OITC when actual assets have been delivered and verified subsequent to the news stories is intentionally misleading. OITC has in fact provided two addresses to the Fiji Government, according to its lawyer. Waffelknocker has provided an address as well. I address this to khaosworks. If you have the proper security clearance and access, the President of China is quite knowledgeable about OITC. How do I provide the administrators an 11 page history, and how do I make sure that it cannot be edited by someone else. The file is a modification locked word file, but I cannot upload it. OITC is not, and never asserted, that it is part of the Federal Reserve. OITC is Chartered by the UN, it is legally considered an independent, sovereign jurisdiction. The Federal Reserve has accounts for sovereign jurisdictions. No bank may respond to an inquiry about an account holder without permission of the account holder. Appointed January 20, 1995 by the Governments of the World to Act as Sole Arbiter, Owner and Controller of The International Collateral Combined Accounts of the Global Debt Facility. The File of H.E. Dr. Ray C. Dam is Secured by U.S. Congress under 3rd Level to the 5th Level Rules, with Appointment and Protective reaffirmed by the United States Senate. His Excellency Dr. Ray C. Dam is an International Protected Person. Elected by those qualified to elect under the existing International Agreements in accordance with the Articles of the Bank for International Settlements (January 20, 1930), on January 20, 1995, Dr. Dam was elected and appointed by the International Community as the Sole Arbiter of all those assets that form the Collateral of International Combined in conformance to that agreed and assented to by the forefathers of that community of nations whose Central Banks are connected to (or were at that time connected to) The Bank for International Settlements. All such accounts of the International Collateral Combined are under the Sole and Arbitrary right of control that was ceded to His Excellency Dr. Ray C. Dam on January 20, 1995 by the International Community and exercised through Consolidated Credit Bank Limited (THIS IS NOT ASSOCIATED WITH A NIGERIAN SCAM THAT WAS RUN OUT OF LONDON AND STOPPED). Under these authorities, no decision of the Federal Reserve or the Department of the Treasury of the United States or Freddie Mac or of any Holder may usurp the institutional authority of the Sole Arbiter and Owner. The right of His Excellency, Dr. Ray C. Dam is established under an Agreement between Nations with security codes registered with the United Nations and all major government security and law enforcement agencies. These short videos are from the March 11, 2014 Signing of GSE CVAC.